If you are juggling work, classes and home life, Linda Bajdo knows your pain. If you want a campus experience that’s welcoming and inclusive, she’s got your back. And if you are conflicted about the meaning of “success,” she has some insight she will gladly share. Shortly after earning a bachelor’s degree in marketing from Michigan State University, Bajdo was hired by Manpower Detroit, a staffing corporation, and began working her way through increasing levels of responsibility and stress. To ensure her career’s continued momentum following a divorce, she took night classes at Northwood University, earning an MBA while working full time and caring for her young son. She was vice president/area manager, responsible for operations at 10 offices when she decided to call it quits. Remarried by then, and with the support of her husband, Michael, Bajdo made the leap from business executive to graduate student at Wayne State University. She chose a field that appealed to her, industrial and organizational psychology, which allowed her to put all that business experience to further use. Even before completing her Ph.D., Bajdo started working part time in Macomb’s Institutional Research Department and learning her away around campus. Her research work progressed to a full-time position, which was followed by an appointment to associate dean. Again, Bajdo found herself on a successful fast track, but it still wasn’t leading to where she wanted to go. When a full-time faculty position opened up in psychology in 2006, she didn’t need GPS to tell her she had arrived at her destination. Since then, Bajdo has been a champion of inclusion on the College’s campuses. 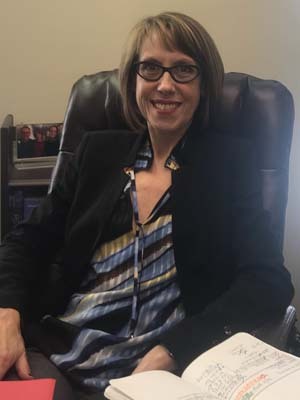 She is a founding member of the Macomb Multicultural International Initiatives, the faculty advisor for the student LGBT Alliance and the coordinator of the SAFE @ Macomb program.